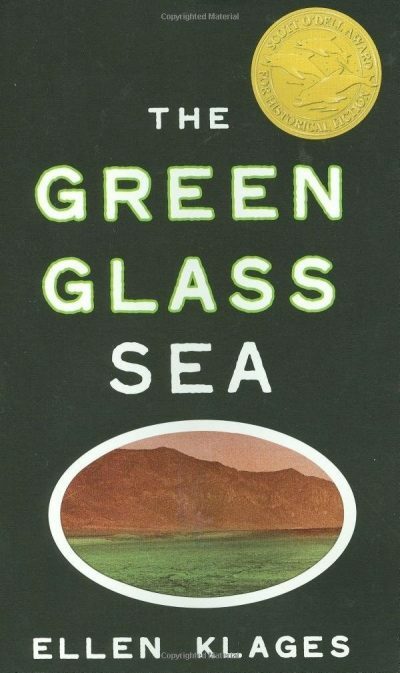 Ellen Klages’ 2006 Scott O’Dell Award winner The Green Glass Sea is a young-adult historical fiction novel. Having been abandoned by her mother and left to the care of her aged grandmother by her hard-working father, Dewey Kerrigan’s life has achieved some stability and comfort. But this too ends. Her grandmother suffers a stroke and there’s no other choice for her but to leave her familiar surroundings for life with her father. In an obscure New Mexican town called Los Alamos. It’s 1943. Los Alamos is essentially a pioneer town built on land commandeered from the previous inhabitants. Its rapidly expanding population is housed in jerry-built facilities of widely varying levels of habitability. It is a town devoted to a singular purpose. That purpose is a military secret, one that Dewey and children like her are not cleared to know. All they can be sure of is that is involves a “gadget,” one that may be crucial to the war effort. While their parents work hard towards their mysterious goal, the children of Los Alamos enjoy childhood in the traditional manner. They form cliques and are viciously cruel to those outside their social circle. Dewey’s deformed foot and unfashionable interest in radios and gizmos make her a natural target. Suze “Truck” Gordon is a target too, although Suze is so far unaware of this. Already accustomed to being ostracized by other girls, “Screwy Dewey” barely recognizes her peers’ hostility. Instead she enjoys life in an environment where her intelligence and curiosity are encouraged, where her intellect is respected by the adults around her rather than being seen as suspiciously unfeminine. Dewey and Suze’s lives are disrupted when Dewey’s father has to leave Los Alamos on a mysterious mission. Unaware of Dewey and Suze’s cordial mutual loathing, the Gordons agree to look after Dewey while her father is away. Much to Suze’s disgust, she will have to share her room with four-eyed Dewey. That’s another disruption. Then another; Dewey’s father dies. What will become of her now? Young readers of an age appropriate for this book may find it hard to believe that there was a time when the US government was unequivocally opposed to fascism. They should bear in mind that this book was written in a long ago age, about an age even longer ago. Adult readers may feel somewhat distanced from any feel-good narrative if they remember that the background effort that brings Dewey and Suze together is a long-running project to turn a couple of hundred thousand Japanese people into cinders and shadows. Well, emend that. The original idea was to turn a couple of hundred thousand German people into cinders and shadows. It’s just that the Nazis folded before the Gadget was ready. It would have been a shame to have built the bombs and then not use them. Adults may also remember that during the period in question, the Germans and Japanese were chewing though their victims at a rate of a Hiroshima every few weeks. There was good reason to fear that the Germans, at least, might have their own atomic bomb program. Kids may not pick up on any of this. It’s not that clear from the text to what use the Gadget will be put. Adults will recognize a cut-off news announcement near the end of the book, but young readers unfamiliar with Hiroshima and Nagasaki might entirely miss its significance1. What young readers will enjoy are the characters and their gradual realization that they have more in common than they at first believe. They are both bright and neither is interested in the feminine pursuits expected of girls in the 1940s. Both are social outcasts (although it takes a while for the penny to drop for Suze; she thought she was a natural leader). The trifling matter of Hiroshima aside, this is a heart-warming story about two dissimilar girls finding common ground, finding family in a society that does not value their strengths2. The Green Glass Sea is available here (Amazon) and here (Chapters-Indigo). 1: If your children (or nieces and nephews) do not know anything about Hiroshima and Nagasaki, I recommend giving them that touching children’s adventure, Barefoot Gen.
2: I did wonder what became of Dewey. It seems likely she would want to go to university and her adoptive parents are the sort of people who would encourage her. She would be entering university in the early 1950s; just how friendly would an American university have been towards a bright woman interested in STEM? She was probably too young to be reading this book, though. She would be entering university in the early 1950s; just how friendly would an American university have been towards a bright woman interested in STEM? Probably quite friendly. America went HARD for technology in the 50s due to the Red Scare and aerospace, electronics, computer and other such companies were desperate for engineers as they raced to be first at the Pentagon trough. This was the time of adverts in Popular Mechanics for young engineering hopefuls, correspondence courses for draughtsmen and the like with whizzy pointed-rocketship clip art. ICBW that The Red Scare really hit as regards technological superiority when the Sputnik space probe flew ever in 1957, which may be inconveniently late for these characters. I've seen a reprint feature from "MAD" Magazine claiming to demonstrate proposed American -er - domestic propaganda to promote science, as a result. Not that I'm against promoting science to the public, in general. Women in space came later again, although that had been a popular science fiction topic for quite a long time. There are two more books that follow. White Sands, Red Menace (2008), and Out of Left Field (2018). By 1957, Dewey has a PhD in Mechanical Engineering (from Berkeley), and is doing post-doc work at the Servomechanisms Lab at MIT, building better robots. PS: I’m curious. Green Glass Sea was published more than a decade ago. A friend says this review was commissioned, so I’m curious: by whom? That person is free to chime in but I don't feel comfortable supplying their name without permission. There's going to be a third book?!?! That said, the next commissioned book is from the 1980s. I love that people commission reviews of older books from you! And I enjoy the reviews very much, too.